Come to the LGBTQ Resource Fair sponsored by Saint Mary’s College’s Sexuality and Gender Alliance Club (SAGA) and get to know the LGBTQ/Ally organizations, groups, and individuals who provide resources and serve the local community. The event is free and open to the public. 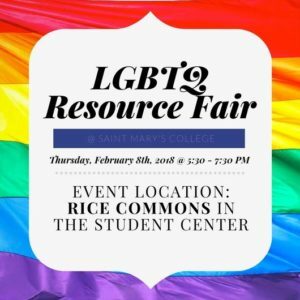 The fair is on Thursday February 8th at 5:30pm at Rice Commons (in the Saint Mary’s student center). Students and South Bend Community – Come and join others to meet other LGBTQ and Allies and find out about the resources available. LGBTQ Groups and Ally Organizations – Sign up today to be part of this fun and educational opportunity. There is no charge to participate. To sign up as a group, go to: LGBTQ Group Registration. Deadline is January 24th. For more information, contact the event organizer Sushi Le SMC ’20 at: dle01@saintmarys.edu.